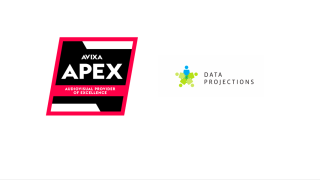 Data Projections has qualified as an AVIXA AV Provider of Excellence (APEx)—a program designed to recognize integration companies and AV design consulting firms that meet key markers of industry excellence. “There are industry standards for excellence and the AVIXA certification is an important way for us to demonstrate this,” said Robby Turner, executive vice president. “We have always been committed to providing our clients the best solution on the market, and that includes our employees as the solutions we provide for each of our clients,” Turner concluded.